Balewrapper X2 – Why Wrap? The race begins between you and bad weather as soon as the hay is cut, trying to get your crop off the field and covered up before it loses its nutrients. Balewrapper X2 is helping more farmers realize the major benefits of feeding high quality hay to their cattle year-round. Round or square the Balewrapper X2 takes them all. Now, as fast as bales are made they can also be wrapped. 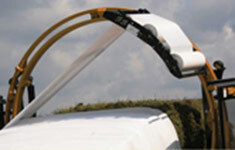 Balewrapper X2’s tight film seals the bale inside, keeps the air outside and the nutrients in the bale where they belong. 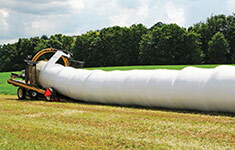 The new Tube-Line Balewrapper X2 TLR 5000 Automatic, focuses on round bales and operators needs. 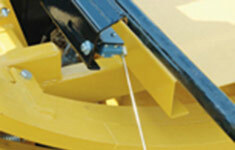 This round bale only wrapper has been refined resulting in a lighter, more maneauverable machine. 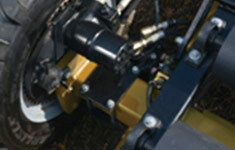 These standard features give you more control and easier operation. Operating controls are positioned above the engine for ease of use and “heads up” usability. 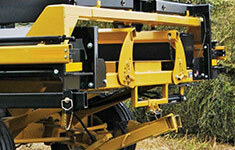 Included Guide Rollers ensure performance even on uneven ground. Standard Traction implement tires give the TLR 5000 sure footed long life performance. 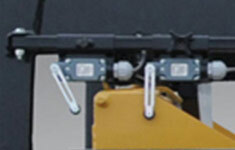 The engine is placed below the main controls for easy access and control. 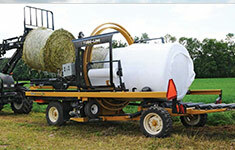 Allows you to change the cycle times to fit your bales. 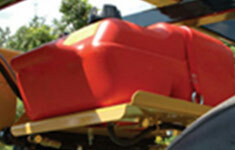 A high capacity fuel tank means less stops for fill ups. Reduced friction allows push ram to move with less wear on the frame. 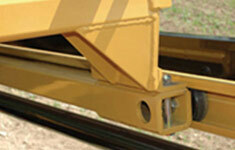 Deck to ground contact provides the friction needed for a tight pack between bales. No need to self propel from the end of the row due to our pull away design. Tubeline wrappers tow from the front, always keeping the tongue accessible. Allows you to double the protection and seal in quality all in less time. 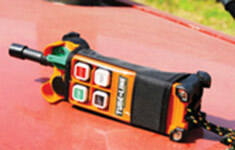 Control the wrapper from the tractor with this rugged controller. 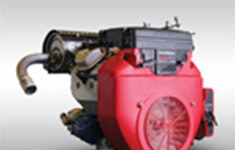 20 HP 613 cc engine with high flow pump for a faster cycle time. Shuts the wrapper down when the film roll is empty so no bales are missed. 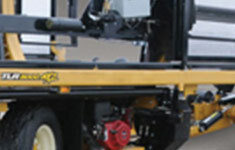 Easily drive and reposition without towing. 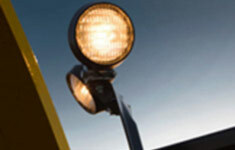 Available in single or dual wheel drive configurations. Keep working until the job is done, even after the sun is gone.